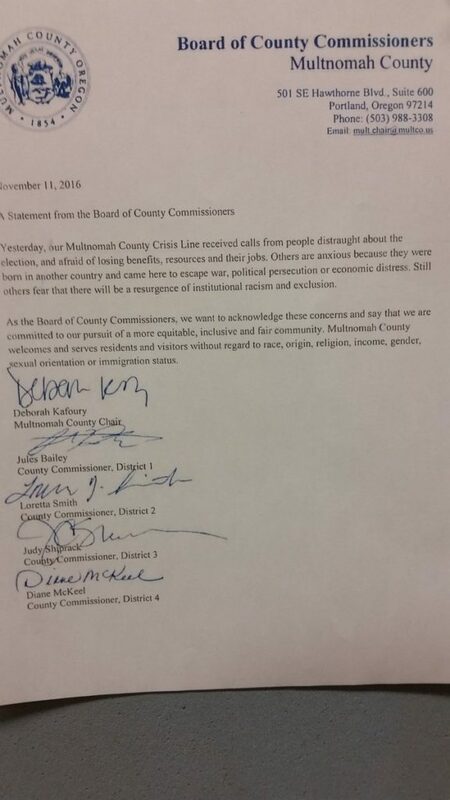 Not much to say about this except that the Multnomah County Commissioners’ heads are wedged so far in their deep, recessed ‘brains’ they don’t understand there’s a huge contingent out there who are not disconsolate at all that Trump is president. Yesterday, our Multnomah County Crisis Line received calls from people distraught about the election and afraid of losing benefits, resources and their jobs. Others are anxious because they were born in another country and came here to escape war, political persecution or economic distress. Still others fear that there will be a resurgence of institutional racism and exclusion. As the Board of Commissioners, we want to acknowledge those concerns and say that we are committed to the pursuit of a more equitable, inclusive and fair community. Multnomah County welcomes and serves residents and visitors without regard to race, origin, religious, income, gender, sexual orientation or immigration status. And it was signed by Deborah Kafoury, Jules Bailey, Loretta Smith, Judy Shiprack, and Diane McKeel. Color us stunned that a Klingon translation was not provided to the voting public. You Don’t Get It. Investigate Hillary Because It’s Your Job. We hear the blythe comments on the chat shows now that since Donald Trump pulled off an electoral miracle and won the presidency against the DNC, Clintons and the media–but I repeat myself–he should, for comity’s sake, call off the DOJ and FBI from continuing their investigations of Mrs. Clinton. Mrs. Clinton broke several laws in her email server set up. Furthermore, she monetized her State Department office by giving family foundation “donors” special meetings and allegedly other spiffs. So much for canons of ethics and propriety. So odious were these effronteries that even Democrats said ‘aw, hell naw’ when it came to pulling the lever for former Obama Administration state department chief. But here’s the thing, with the call by the Democrats and now some on the Republican side to go easy on Mrs. Clinton to make sure people understand it’s not a political vendetta, they’re just underscoring the fact that it IS all political. As we learned from FBI Director Comey when he whipsawed the country with his “Chinatown” investigation–she’s guilty, she’s not guilty, she’s guilty, she’s not guilty–people were rightly concerned about the taint of politics involved here. And now for all those deplorables disgusted by what was obviously a two tiered legal system writ large in the dealings with Mrs. Clinton, they’re now supposed to purr to themselves that it’s alright because ‘we won’? No, it doesn’t work that way. It’s not your call. It’s the law’s call. No lectures about prosecutorial discretion. When something so egregious as a woman selling her office for personal gain–the country’s security and place in the world be damned–it’s not “political” when she’s investigated for malfeasances and utter disregard for her oath. You want Trump to start draining the swamp? Then drain it and let people know you’re serious about it and won’t tolerate this behavior. That’s why the people hired you. When you don’t, you’re merely another swamp thing.